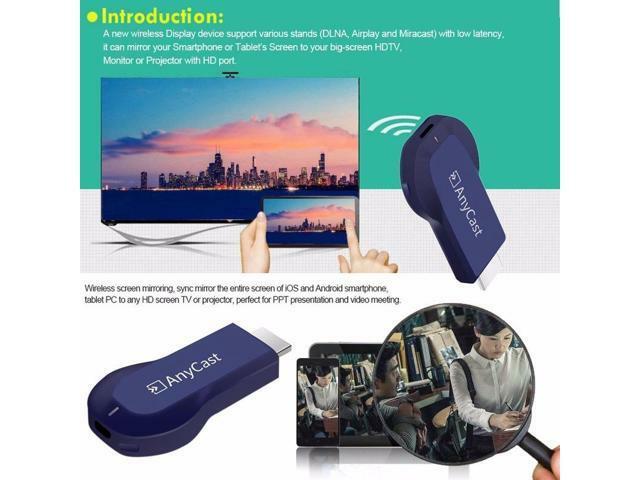 Note 1: Please make sure that your smart phone and Tablet PC support Miracast, DLNA, Airplay function before you buy it. Note 2: The WiFi Wireless Display Receiver is not compatible with Windows OS. Note 3: The WiFi Wireless Display is only compatible with Smart phone and Tablet PC, not compatible with PC. Note 4: The distance between your Smart Phone / Tablet PC and the WiFi Wireless Display Receiver should be within 6 meters to ensure better transmission effect. Note 5: Please place the external WiFi Module in front of your TV, make sure that there is no obstacle between the WiFi Module and your Smart phone / Tablet PC. Support Photo Format: JPEG, BMP. Office Software Display Presentation: PDF, MS Word, MS Excel, MS Powerpoint. Online & local content wireless display support: Video, Audio, Photo, Office file, Website. Support Video Format: AVI, DIVX, MKV, TS, DAT, MPG, MPEG, MOV, MP4, RM, RMVB, WMV. Support Audio Format: MP1, MP2, MP3, WMA, OGG, ADPCM-WAV, PCM-WAV, AAC. 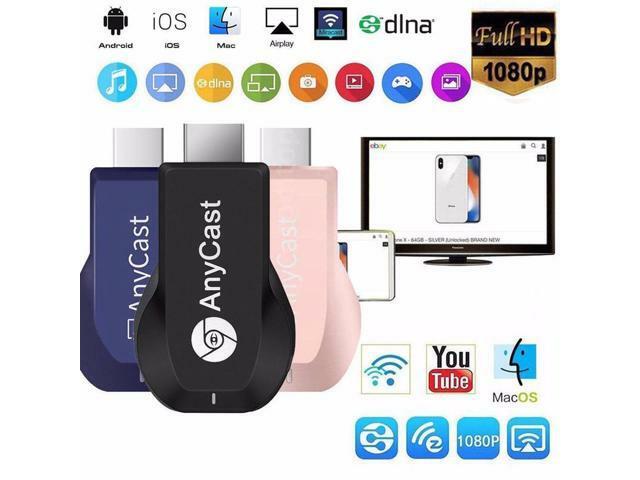 AnyCast is an WiFi display receiver, which supports the Miracast standard for Android device, and DLNA for home multimedia application. Furthermore, it also comply with for AirPlay for iOS mirroring. 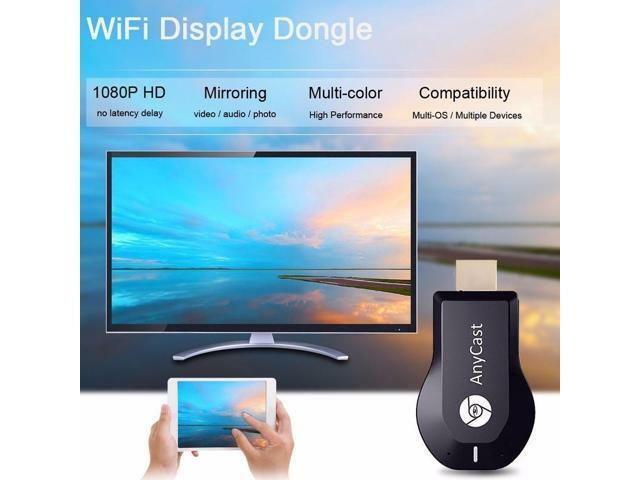 Enjoy screen mirroring with AnyCast New. It allows users to easily share photos, music, videos, PPT and other content in your smart phone, tablet PC to a bigger screen like HDTV or projector. Wireless screen mirroring, sync mirror the entire screen of iOS and Android smartphone, tablet PC to any HD screen TV or projector, perfect for PPT presentation and video meeting. 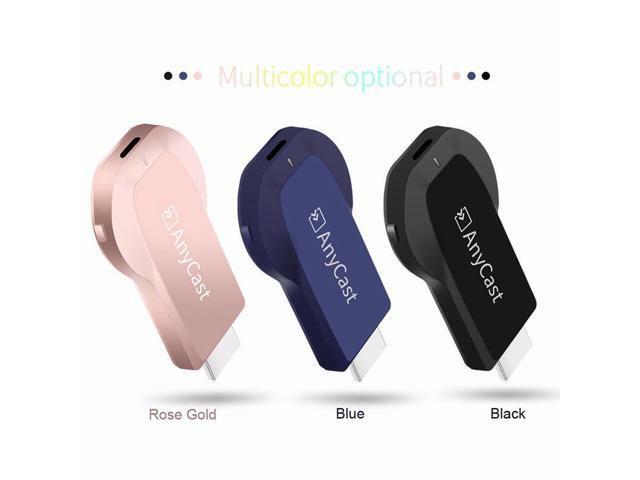 External WiFi module, supports 802.11b/g/n wireless connection, 2.4GHz WiFi, strong signal, supporting online & local content wireless display: Video, Audio, Photo, Office file. 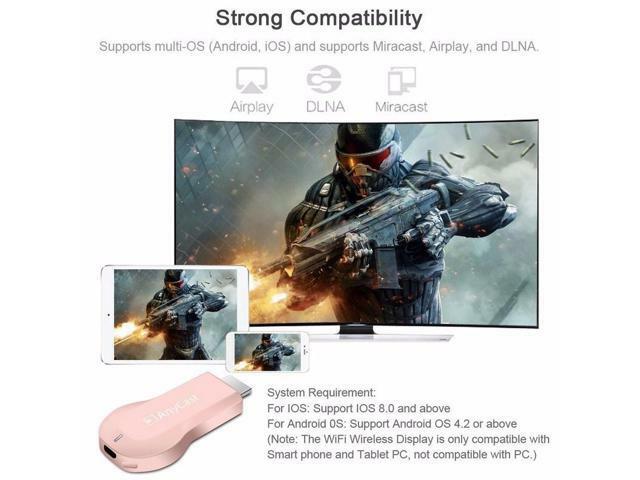 Supports multi-OS (Android, iOS) and supports Miracast, Airplay, and DLNA. Works for iOS 8.0 and above devices with Airplay and Android 4.2 and above with Miracast. Just press one button to freely switch between Airplay and Miracast mode. Plug and play, no need to install drivers, easy to operate. Ultra low power consumption, and low heat. 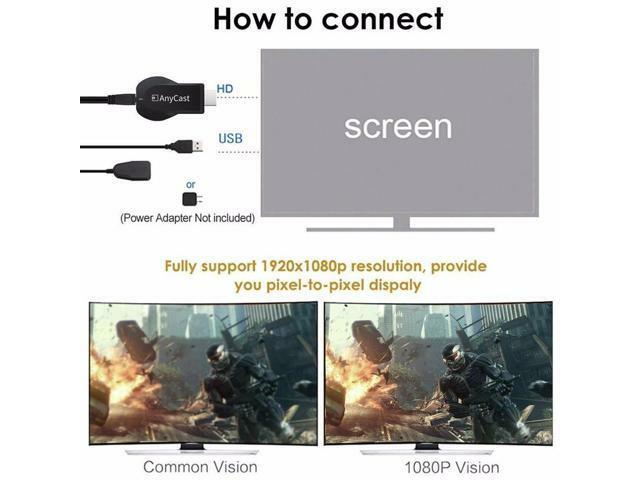 Supports Full HD wireless audio and video transmission, 1080P output with HD interface. Uses compact portable deign for easy carrying. Features Wireless Display: Wireless screen mirroring, sync mirror the entire screen of iOS and Android smartphone, tablet PC to any HD screen TV or projector, perfect for PPT presentation and video meeting. This item is covered by CESMFG Marketplace Return Policy.